Wulf is an Imperial warrior located in the Tower of Dusk, Ghostgate. He is actually an aspect of Tiber Septim. You can only encounter him while the Main Quest is active, after receiving Wraithguard, and before destroying Dagoth Ur. 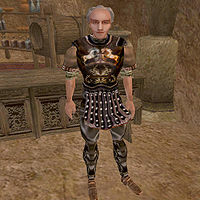 If you don't visit Ghostgate before destroying Dagoth Ur, he will be absent from the game from there on. If you do visit and talk to him while he is present at Ghostgate, he will offer you a special coin. Accepting this coin gives you a new power, Luck of the Emperor (Fortify Luck 20 pts for 120 secs), however you do not need to carry the coin to use the power. Ghostgate: "This is a helluva place. Why are you here?" Perhaps I should keep my business here secret: "Suit yourself. I don't know why you'd bother to keep anything a secret here. I was just wondering if you might be headed inside the Ghostfence to Dagoth Ur." I am the Nerevarine, and I go to confront Dagoth Ur in his citadel: "What a piece of luck! Look. I'm an old Legion veteran, as old as the poor old Emperor, bless his soul. I'm too old for campaigning. I came this far to look at hell. But I can't go any farther than this. I'd take it kindly if you'd carry this old lucky coin with you when you go to Dagoth Ur. Sort of a token of the tough young hero I used to be. Would you do that for an old man?" I'm sorry, but my mother told me never to accept gifts from strangers: "You're a suspicious sort. But maybe I can't blame you. Worried about a request from a strange old man in a strange place like this. Well, I won't press you. But I would sure be grateful for the favor, if you could see your way to changing your mind." I'll take your old lucky coin to Dagoth Ur with me: "That's very kind of you. Here's the coin. I've had it with me a long time, and it's always brought me luck. But I have no more use for it, and I'd like to pass it on to somebody younger. Somebody going places I can't go anymore. Your generation's shaper of history... an engine of destiny. That coin will bring you luck on the mountain. I promise. 'For Emperor and Empire,' as we say in the legions. Go with Kynareth." Poor Old Emperor: "The Emperor is getting old. Don't know how much longer he'll hang on. So is the whole Empire, for that matter. Getting old, that is. The Emperor and the legions have held the Empire together for hundreds of years. It's been a good thing, by and large. But maybe it's time for a change. Time for something young and new. What? No idea. Because I'm old. Old dog doesn't get new ideas. But maybe young folks like you should try some new ideas. I don't know. Could be messy. But change is never pretty." This page was last modified on 19 June 2016, at 16:08.